This is the perfect summer soup!! Yes, you can still have soup in the summer despite the hot temperatures...and you should! Bone broth is important to incorporate into your diet all year long as it is great for gut health. 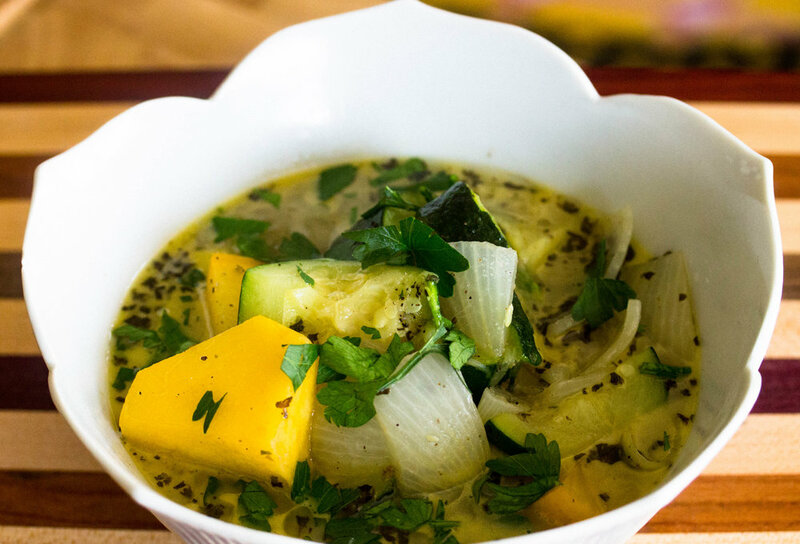 The best thing about this soup is that it is incredibly refreshing and light but also makes great use of any zucchini you have from the garden. I chose to cut the veggies in big pieces for this soup but you can chop them however you'd like. I also recommend using either coconut oil or ghee (clarified butter) for the source of fat for this soup. Ghee will make it creamier and coconut oil keeps it really light, either one tastes amazing with this soup. I also love it garnished with fresh parsley and even topped with avocado for added flavor and healthy fats! Hope you enjoy! Melt butter in pot then add coarsely chopped veggies, toss until well coated. Allow veggies to saute for a bit until they begin to sweat (about 3-5 minutes). Add oregano, basil, sea salt and black pepper and combine well. Add broth and bring to a boil then let simmer for about 20-30 minutes until veggies are soft.